Platform canopies following the curve of the tracks at Tynemouth Station, Northumberland. 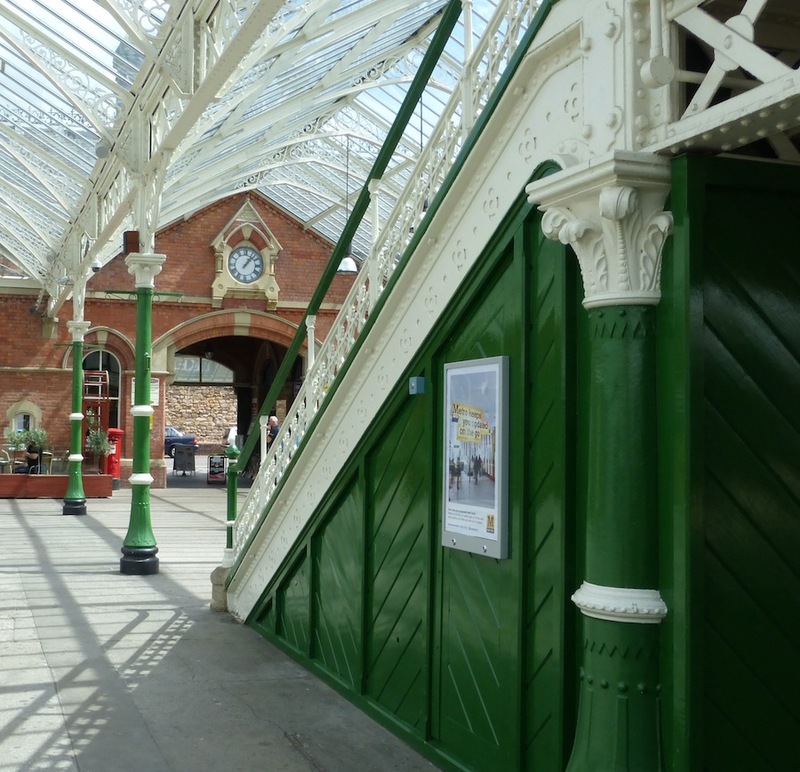 Tynemouth Station. 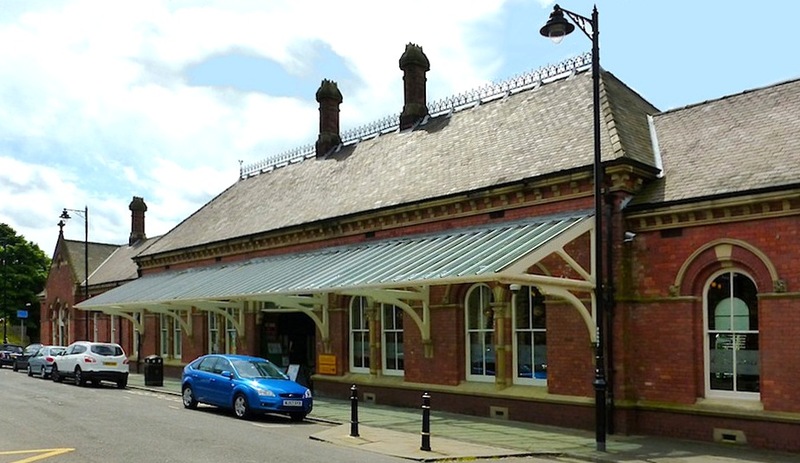 This is a Grade II* listed building designed by William Bell (1843-1919), who "spent his entire working life with the North Eastern Railways and .. rose to become Chief Architect from 1878-1914" ("William Bell"). 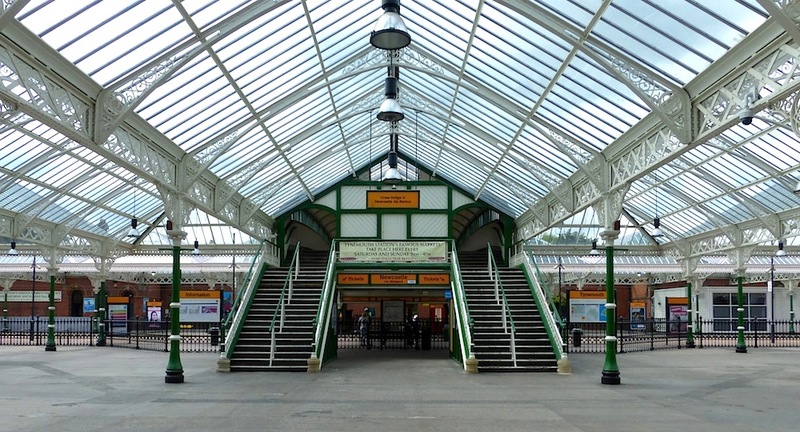 The station was opened in 1882, and completed the loop linking the Newcastle to North Shields line, and the coastal service from Newcastle to Whitley Bay. Both lines were then owned by the North Eastern Railway Company. 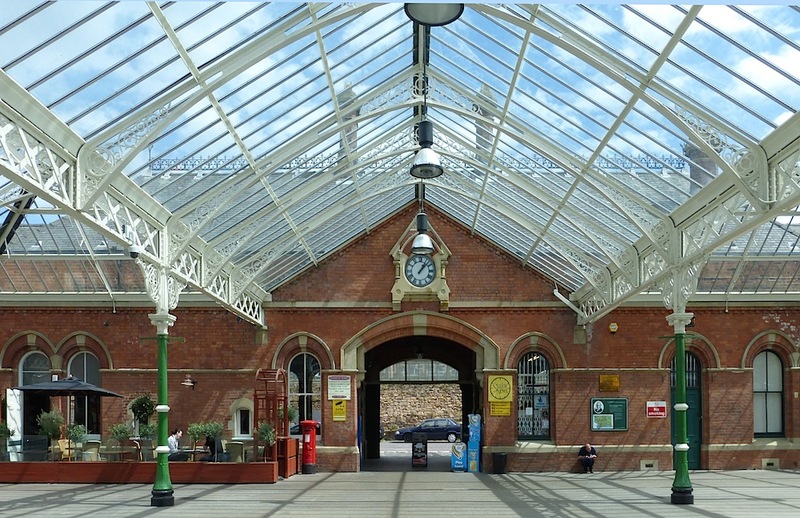 Its chief attractions are its "gloriously exuberant" vistas of glazing and ironwork (Grundy et al. 594). Left: Looking at a greater length of the far platform. Right: Looking across the concourse with an entry to the nearer platform. As often noted, this masterpiece of glass, with wrought-iron and cast-iron, looks more like a winter garden than a station concourse. It was perfect for sheltering the hordes who commuted back and forth to nearby Newcastle by train, and the holiday-makers who poured into the pleasant resort of Tynemouth in the summer. It was also important for trading purposes, since Tynemouth had a large fish market. 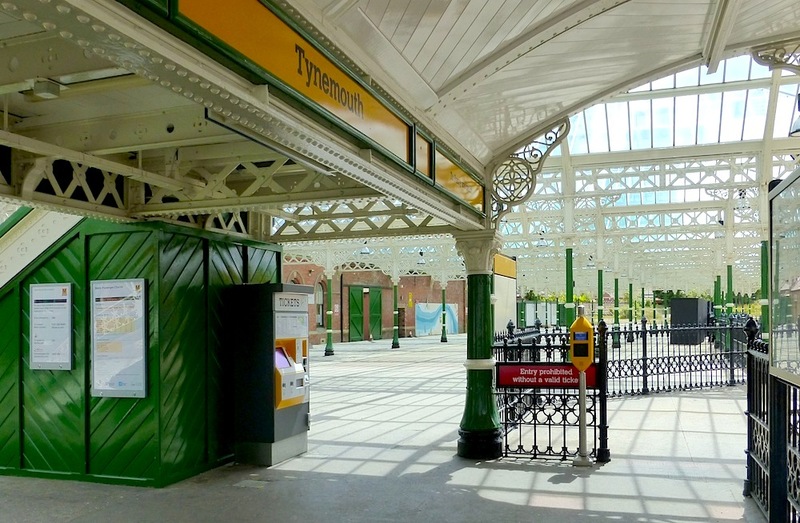 Recently restored following the successful campaign of "The Friends of Tynemouth Station," it serves not only as a metro stop but also as "the most successful vintage market in the region" (Davies 37). Left: The stairs up to the footbridge. Right: Looking at the station entrance from beside the stairs. Perhaps this is the best place to take in the full glory of the station's "ornamental spandrels and apex, supported on non-classical columns with foliated capitals" ("Tynemouth Station"). The bridge itself used to be decorated with exotic plants, reinforcing the station's holiday atmosphere and its resemblance to a great glasshouse. This area can now be used as exhibition space. Left: The station building from the interior, from the front of the stairs. Right: The "Stephenson Trail" plaque. The plaque to the right of the main door shows a picture of Robert Stephenson, because this station is part of the "Stephenson Trail." 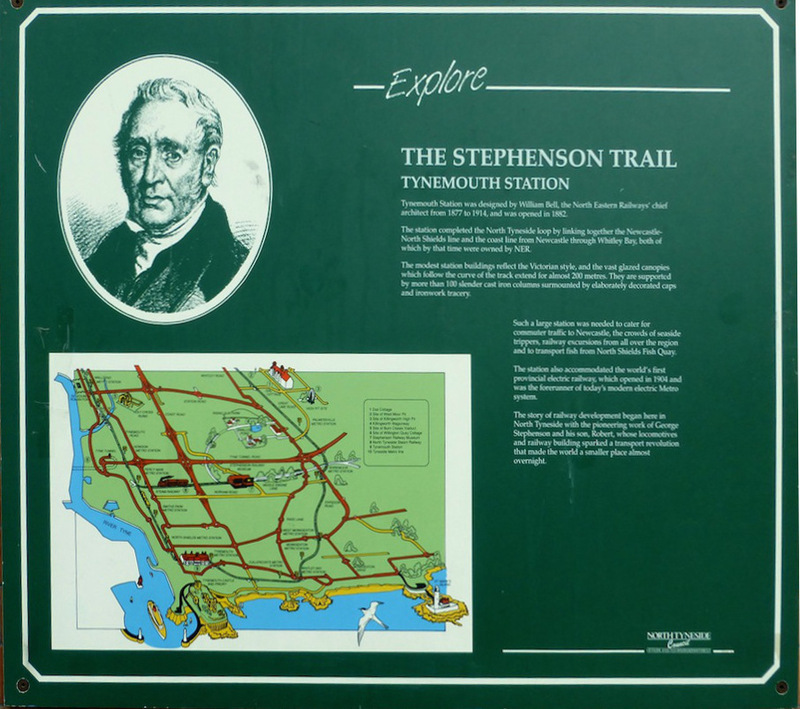 It reminds us that North Tyneside was where the railways began, with the work of both George Stephenson and his son Robert. It also offers the information that "more than 100 slender cast iron columns with elaborately decorated caps and ironwork tracery" support the "vast glazed canopies" which extend for almost 200 metres. The exterior of the station, on Station Terrace. The exterior of the station on Station Terrace is less decorative than its concourse, footbridge and platforms, but is proportionately wide, with twenty-one bays in a mildly Gothic style with decorative ironwork cresting the slate roof. Its red brick is relieved by stone dressings, "all well carved" like the surround of the station clock on the interior (Grundy et al. 594). Taken as a whole, this is a highly distinctive station with an unmistakably Victorian atmosphere. Grundy, John, et al. The Buildings of England: Northumberland. 2nd (revised) ed. London: Penguin, 1992. 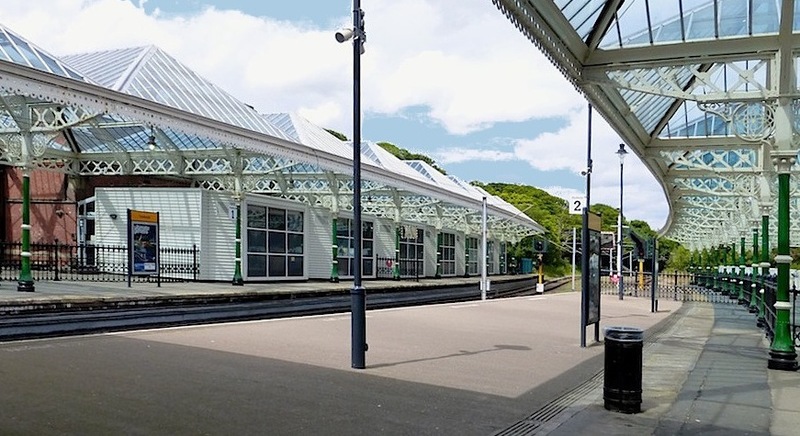 "Tynemouth Station Main and Subsidiary Buildings with Canopies and Footbridge." English Heritage. Web. 24 September 2014. "William Bell." Dictionary of Scottish Architects. Web. 24 September 2014.